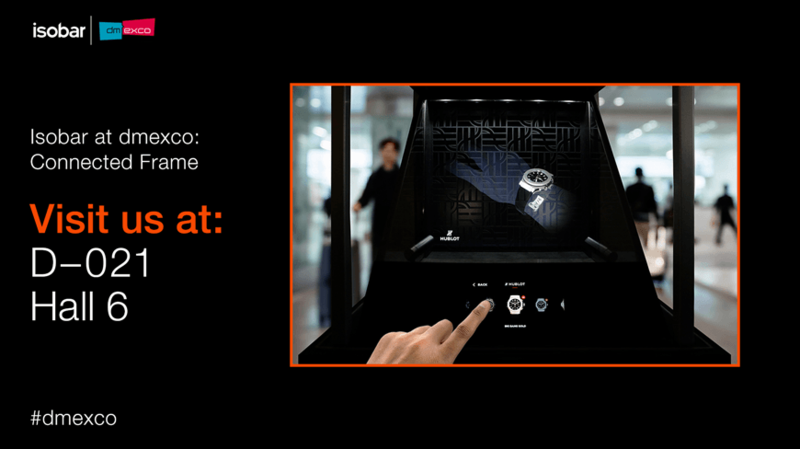 ‘Connected Frame’, an augmented reality (AR) retail innovation conceived for leading luxury client Hublot, takes centre-stage at the Dentsu Aegis Network booth at dmexco this week. The innovation uses AR technology integrated with Salesforce CRM software to neatly close the gap between brand inspiration and transaction. The ‘Connected Frame’ journey begins when a customer places their wrist under the showcase. The user's movements are transmitted in real time to create a 3D holographic image of the wrist carrying the watch model of their choice displayed on screen. blue-infinity Linked by Isobar developed proprietary technology in-house, to perfect the virtual display and ensure an optimal experience. Customer data is collected using a smartphone interface and integrated into Hublot touch points in Salesforce CRM. The display also offers an intelligent solution for the storage and safety of valuable watches in the retail market. dmexco, an international leading digital marketing conference, provides a fitting backdrop for the experience, as its content centres on the “digi-conomy,” digital transformation and innovation. Businesses are looking for solutions to help unlock the digital potential of their organisations, and innovations utilising creativity and technology, such as this ‘Connected Frame’ demonstrate what is possible in the digital economy. Through using technology and data, brands can provide improved brand experience, integrated and adapted to each part of the customer experience and journey. Mario Ballario, Front End Dev Practice Manager, blue-infinity Linked by Isobar, says, “The opportunities for AR at retail are limitless. Retailers have already rolled out consumer-facing AR to enable virtual shopping for clothing, make-up and accessories. What is unique here is that whilst most AR applications today are mobile based, our AR experience is accessible to all shoppers – through the simplicity of a kiosk solution that provides a premium and engaging experience.” Find out more about Mario’s thoughts on AR and the future of shopping in our latest interview. Experience the display case here, or visit the Dentsu Aegis Network booth at dmexco, Hall 6 D-021 (close to Spotify) to try out a luxury timepiece for yourself.